Information regarding the HS2 Phase 2b Sheffield Meadowhall station that was proposed in 2013. The proposed station at Sheffield Meadowhall would serve South Yorkshire and is located near the Meadowhall retail complex. The high speed rail line would be on a viaduct, at approximately the same level as the upper deck of the existing M1 Tinsley viaduct. There would be 4 high speed platforms, which would be arranged as 2 islands. Two additional central tracks would be dedicated fast lines for trains not stopping at the station. The station entrance and forecourt would be located directly below at street level and the main station building would be about 250m from the Network Rail station at Meadowhall Interchange. 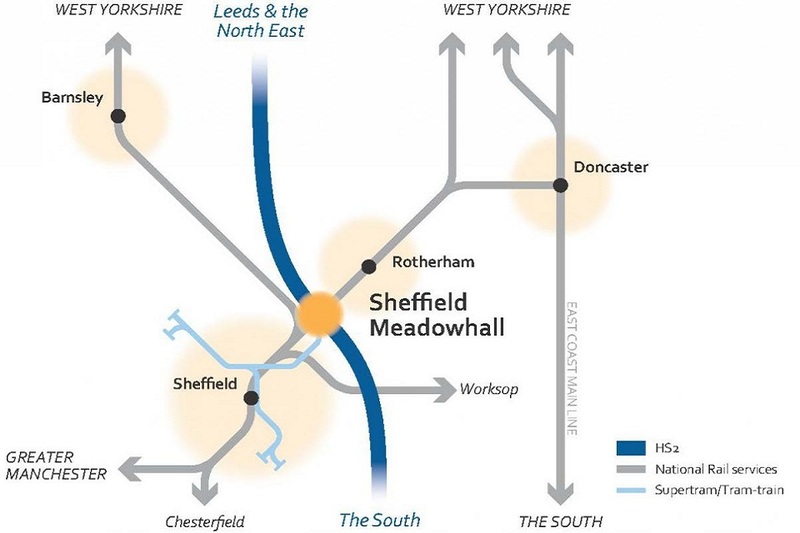 HS2 Ltd’s analysis suggests that the Sheffield Meadowhall station could support between 4,000 and 5,400 jobs and between 250 and 300 houses. The journey times to London would be 1hr 9 minutes with Birmingham being 38 minutes away. This station is well placed to encourage jobs and growth in the South Yorkshire area, and already has excellent connectivity with existing public transport networks. Up to nine trains per hour run into Sheffield Midland station with a journey time of as little as five minutes. Trains also connect Meadowhall with Rotherham, Barnsley and run beyond that to Wakefield, Doncaster and Scunthorpe. The site is also close to Junction 34 of the M1 motorway making it easily accessible by road.